Clos Ste Magdeleine offers you guided tours of its vineyard in a unique setting by the sea! Discover the history of this estate with its exceptional panorama under the classified cliff of Cap Canaille and its vineyards by the sea. This discovery tour will take you from the panoramic terrace facing the sea, to the press via the cellars followed by a tasting of 2 wines from the estate. Duration: about 1 hour (including tasting time). By foot: 10 minutes walk from the port, behind the castle hill. Nearest public car park: MADIE. 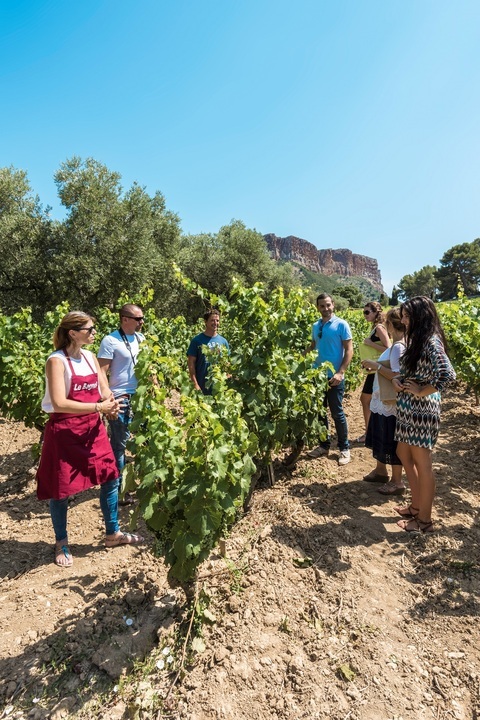 Domaine du Paternel welcomes you to its Cassis vineyard for a guided tour. Come and discover the history of the estate, the Cassidain terroir, the press room, the winemaking area with stainless steel and concrete vats, the bottling line... To conclude the visit, you will be offered a tasting of a selection of wines in AOC Cassis but also in appellation Côtes-de-Provence and Bandol from our vineyard in Saint Cyr-sur-Mer. Duration: about 45 minutes (including tasting time). Domain accessible by car with on-site parking (area not accessible by foot). In the shelter of Cap Canaille, Domaine du Bagnol, created in 1867 by the Marquis de Fesques, welcomes you for a guided visit of its vineyard. After admiring its fabulous panorama, you will follow the path of the grape, from the vineyard to the cellar. Vinification techniques will no longer hold any secrets for you! You will then be able to refine your knowledge around 2 to 3 wines of the estate. This tour will delight both beginners and advanced visitors with the beauty of the place, marked by its history and the detailed explanations of your guide. Duration: about 1 hour (including tasting time). The estate is located 10 minutes walk from the port. Parking is available on site.